A nationwide glitch in Target's pricing system is costing shoppers money. It's not uncommon for stores to sell dually-located items. Target sells children's medicine in both the baby and healthcare aisles. While many people might not think to check both areas to compare prices, they should. 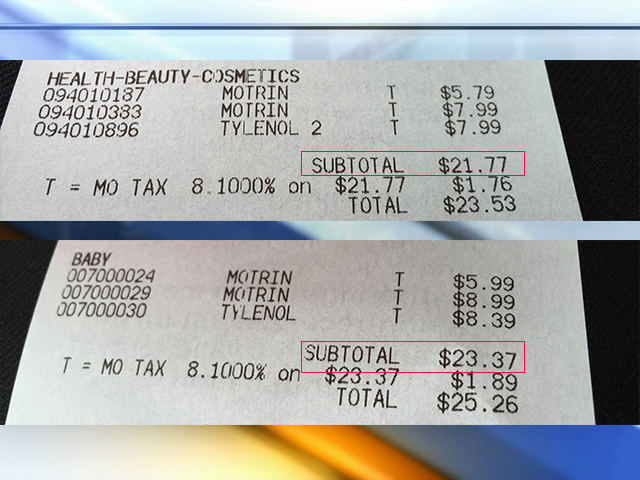 While shopping undercover, investigators with sister station KSHB in Kansas City purchased infant's Tylenol and two different kinds of Motrin from the baby aisle. The same items were picked out near the pharmacy in the healthcare section. When checking out, the three products from the baby aisle cost $1.60 more without tax. Other products like Gripe Water and Motrin both cost a dollar more when bought from the baby aisle. In addition, sticker barcodes were pasted over the original barcodes on items found in the baby aisle. While still undercover, investigators questioned a manager about the markups. He said he had no idea it was happening. "Wow, that's crazy. I buy stuff here," he said. "I usually go to the pharmacy part, which one is cheaper do you think?" Parents also had no clue they were spending more when buying these items from the baby aisle. "I'm irritated because my kids go through that stuff like it's water," one mom said. "That's crazy." Another mother said she never would have checked both aisles, under the assumption that one would be charging more for the same items. "I guess I won't be going back to the baby aisle," she said. Target refunded the investigators under it's price-matching policy and refunded the difference. After being notified of the issues, Target spokeswoman Kristy Welker later told investigators that the store had found an error in its pricing system. The store issued the following statement. Accurate pricing is important to Target, and we value the trust that our guests place in us. We researched this issue and found an error in our pricing system affecting these four products. We apologize for this inadvertent error and the confusion it has caused. Once we were made aware of the issue, we updated the pricing systems to reflect accurate and consistent pricing of these dually-located items. The consistent, revised pricing is now displayed in our store. Guests who bought these items within the baby department can bring their receipt to Guest Service at their local Target store, and the price difference will be refunded. Welker told investigators that Target's computer system is supposed to send an alert when dually-located items are not priced the same. In this case, she said the system failed. Welker said the prices of the products found the baby aisle will be lowered to match the prices on the items in the healthcare aisle.